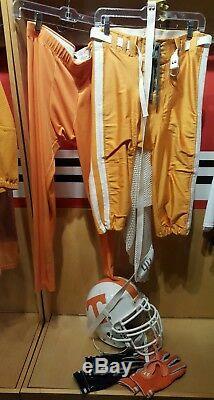 You just dont find full uniforms put together from the same player and then come available to the public. Includes all of the following. 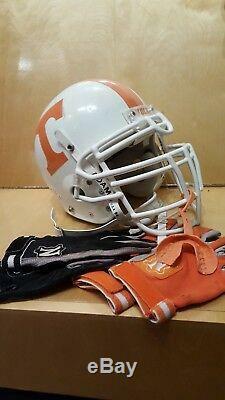 Game worn helmet with chin strap and mouthpiece (used). 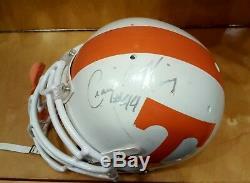 Helmet is autographed in silver sharpie on top. 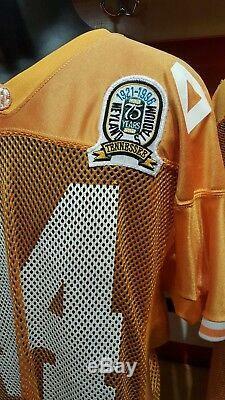 Game worn jersey with neyland stadium patch celebrating the 75th year of Neyland stadium and player name on back KING. Game Pants with 2 belts. 2 pairs of gloves, one black, the other orange. 3 pairs of air Nike cleats, one pair still has mud from the field underneath the sole, one pair signed on both shoes, one pair is completely NEW NEVER WORN. THE CLEATS ARE JUST HUGE size. The helmet itself weighs a ton. 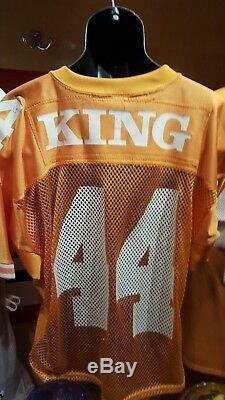 Craig King, LB - Asheville, N.
Year G UT AT TT SCK TFL FF FR PBU 1994 11 14 5 19 - 3 - - - 1995 9 26 10 36 - 1 - - - 1996 11 27 10 37 0.5 4 - - 1 +-----------------------------------------------+. Totals 31 67 23 92 0.5 8 - - 1. 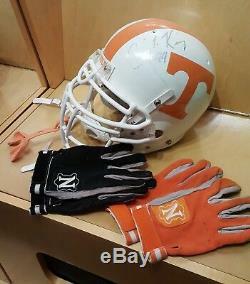 The item "University Tennessee game used football jersey pants helmet gloves cleats LOT" is in sale since Saturday, February 16, 2019. This item is in the category "Sports Mem, Cards & Fan Shop\Game Used Memorabilia\College-NCAA". The seller is "othawk" and is located in Dandridge, Tennessee. This item can be shipped to United States.